GI Style Double Strap Duffle Bag Black | BUDK.com - Knives & Swords At The Lowest Prices! Keep all your gear together in this large military-grade GI-style Double Strap Duffel Bag constructed of durable, heavyweight cotton canvas. 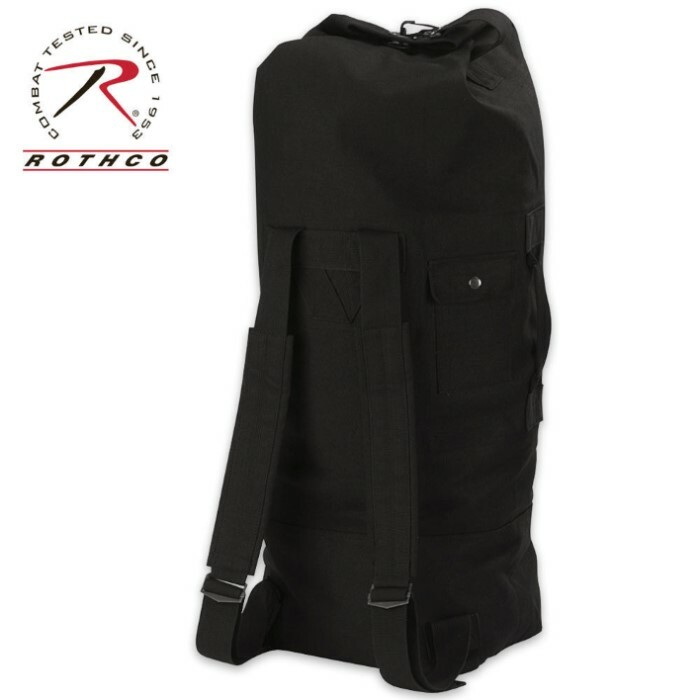 It features two fully-adjustable shoulder straps for comfort, convenience, and easy carry. use this bag as our zombie bug out bag. lol. it is great stores our his and hers weapon sets, 30" sword, 25" machete, two 12" knives, harpoon set, fire starter, mini shovel, tons of paracord, zip ties, several reflective blankets and even a small crossbow with lots of bolts. we keep our sharpeners in the outer pocket to keep them separated. the comment that said to no use for large weapons, i see what he could be saying, but i like to wrap all our weapons in cloth anyways (old shirt or something) for a few reasons, keeps them from clanging together and damaging each other and my other items in the bag like water bottles, etc. dont want a knife going through your only water, or your back. but also because you dont want your metal weapons clashing together loudly letting all the zombies know where you are!! and it makes it easier to find things, and keep the straps from getting tangled together. it is a VERY large bag, but luckily the straps dont go to the very top of the bag, i find myself tucking the top into the bag. (especially if zombie apocalypse happens, we'll likely have the two big weapons out, and the whole top would tuck inside, making it more manageable. overall great bag, perfect for everything we need. couldn't find a cheaper, same size bag anywhere, online or walmart. I have used this bag to haul everything from laundry to groceries...great when the car breaks down...so far it held up to 220 pounds comfortably! A few pockets and A.L.I.C.E. design is older than the MOLLE web-gear I am used to, but strong nonetheless. Great bug out pack. Big has lots of room. Only one extra pocket but plenty of room for a sleeping bag and other containers to store all your stuff. A good 20$+ bag to store all your stuff. just like my sea bag from the military. just a touch thicker and a stronger more waterproof material. so no complaints on that part. very durable. sits kind of awkwardly unless mostly full, but bought it knowing that. much better than my sea bag. Do not get this bag if you are going to store larger knives/ weapons in it. It's a well made bag but is almost too big to work with. I tried putting my machetes in it to carry, but it did not work out mainly because there was too much room inside for them to bash around. If you are going to store clothes or other foldable items, then it's a neat bag to have.